Bettina Mok works from home. Most days, she doesn’t have a reason to leave her apartment. Some days, she doesn’t see anyone at all. So when Blue Zones Project® set up a Walking Moai in her neighborhood, she knew she had to join. The four M’s (Manoa-Makiki-McCully-Moiliili) Walking Moai was just the reason she needed to get moving and meet some of her neighbors while she was at it. "Each week, we pick a different route,” says Mok. “We’ve been on forested trails, historic neighborhood walks, and what’s turned out to be a favorite destination—local cemeteries, full of history, leafy foliage, and peaceful views!" Two months later, Mok walks an average of 1.6 miles every Thursday. She’s made good friends through the group along with connections in her neighborhood. The group has shared firsts, birthdays, and experiences that brought them closer. Mok says the group is especially meaningful to her because she’s lived in Hawaii for only three years. Her new friends are teaching her about local history and where to get the best local grinds. They’re helping her find a new place and have invited her to family events. 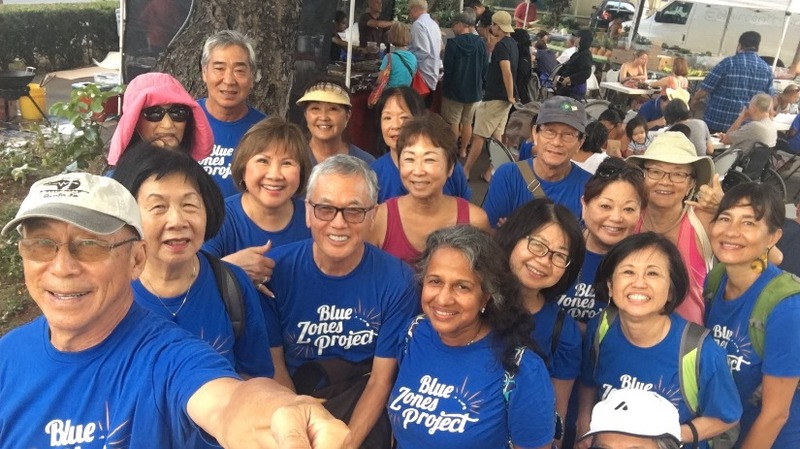 "We wear our Blue Zones Project shirts proudly on our walks and remind each other of healthy eating habits when we go out,” says Mok. “I’m happy to say that this moai will continue … there’s so much to see in our community. So many restaurants to try, more neighbors to get to know … the path to wellness and community-building is limitless!"